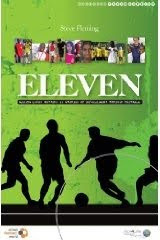 Focused on eleven individuals Eleven contains stories of how football can transform the lives of disadvantaged people around the world. Each story focuses on a different social issue from drug and alcohol abuse to HIV, poverty and gang crime, and looks at how the power and popularity of football has inspired people to turn their lives around. Based on the work of organisations from countries such as India, Uganda, Colombia and the UK, the stories also tell how the Development through Football movement has emerged over the last ten years. Tourismupdate.co.za is reporting that all Namibian border posts are currently closed for overland tours as drivers are not being issued with temporary work permits to travel into the country. A statement from the Namibian Tourism Authority is expected anytime soon. We'll keep you posted! UPDATE: borders are open again for overlanders "Access into and departure from Namibia will be allowed to all foreign guides and drivers with or without valid work visas for the time being." The 11 day Kruger National Park & Okavango Delta tour is starting every Saturday from Johannesburg & Pretoria (and Nelspruit). First highlight along the way is the famous Panoramic Route, where we stop at God's Window, Bourke Luck Potholes and the third largest canyon in the world - the Blyde River Canyon (stop at the famous Three Rondawels view point). Early next morning we are driving towards the Kruger National Park, where we are spending the next two nights. Our stay in the park is including morning & night drives as well as drives during the day. In the end you spend the majority of the days in the park in our open safari vehicles. Next stops after leaving Kruger National Park are Hartbeesport in South Africa and Nata in Botswana, before we are reaching Maun on the edge of the Okavango Delta on day six of the 11 day tour. The days seven, eight and nine are entirely spend in the Delta, before the tour is heading to Nata on day 10 of the the tour. On the 11th and last day the tour is going back to South Africa. The tour guide will drop all guests at any backpackers hostel, hotel, guest house or the airport in Johannesburg & Pretoria. great book: "A City Imagined: Cape Town and the Meanings of a Place"
If you love Cape Town "A City Imagined: Cape Town and the Meanings of a Place" is one of the books you should read! Six matches are currently oversubscribed (in all categories), among them the semi-finals and the final. In total, 55 matches are oversubscribed in at least one category. The 7 day Okavango Delta tour is starting every Wednesday from Johannesburg and Pretoria to the world famous Okavango Delta. First overnight stop along the way is Nata in Botswana. After a healthy breakfast the tour is getting continued by driving west along the northern border of the Kalahari Desert to Maun, a small town on the edge of the Okavango Delta. The days three, four and five are entirely spend in the Delta, before the tour is heading to Palapye on day six of the the tour. On the 7th and last day the tour is going back to South Africa. The tour guide will drop all guests at any backpackers hostel, hotel, guest house or the airport in Johannesburg & Pretoria. Hostelworld's 8th annual Hoscar (HOStelworld Customer Annual Ratings) awards ceremony took place at the 26. 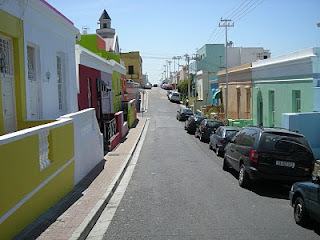 Jan 2010 to recognize the best hostels in the world, voted for by 1 million Hostelworld.com customers in 2009. The overall winner of the night was the Travellers House, a backpackers in Lisbon, Portugal. Cape Town's famous"The Backpack & Africa Travel Centre" was voted the 3rd best hostel/backpackers in Africa by the customers of Hostelword.com. The film got released 2008 in Canada & the US, in 2009 all over Europe and premiered in South Africa at the 22. Jan 2010. The DVD of the movie is already out in the UK and can be bought on amazon.co.uk. Judith Stein's book "When She Was White: The True Story of a Family Divided by Race" about Sandra Laing's life can be bought from the TravelComments.com eShop. The SANParks online booking system will be offline from 18:00 (6:00 pm) at the 26 January 2010 for at least 24 hours to allow for maintenance work to be done. Gorillas in the rainforest, flamingos on a soda lake, an abundance of wildlife in the Ngorongoro Crater, maybe a migration through the Masai Mara and wildlife galore in the Okavango Delta. 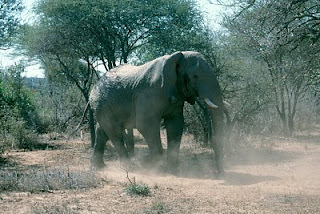 This tour offers a huge variety of game viewing and changing landscapes. Add to this the exotic island of Zanzibar, the beaches of Malawi and the phenomenal Victoria Falls. You can find this uniquely South African 2010 World Cup fan guide on the government's official World Cup website www.sa2010.gov.za. Become a local football fan while exploring all the highlights of this exhilarating country. Grab a Vuvusela and make some local friends at World Cup events, screening areas and fan parks. Experience Football World Cup fever in South Africa's major Cities. This diverse travelling experience stretches from coastal towns with beaches, whales and water sports, to mountainous terrains with forests and hiking trails and National Parks that are home to the Big 5 and other wildlife. The Pretoria to Cape Town World Cup Overland tour combines our Pretoria to Durban World Cup Overland (8 days, 15 June - 22 June 2010), Durban to Port Elizabeth World Cup Overland (8 days, 23 June - 30 June 2010) and Port Elizabeth to Cape Town World Cup Overland (8 days, 01 July - 08 July 2010). All three tours can be booked separately! All you need to do is to visit telegraph.co.uk/mysouthafricanfeast and to click on "Win a trip to South Africa". Fill in the form & you are in! All entries must be received by midnight on Wednesday, March 31, 2010. The prize draw is open to residents of the UK, Channel Islands, Isle of Man and Republic of Ireland aged 18 years or over. The Island Lake at the Wilderness Section of the Garden Route National Park (GRNP) will be temporarily closed as from the 01 Feb till 31 March 2010 due to the extension of current ablution facilities and construction of undercover picnic and braai areas. "The Namib Desert Coast" is a documentary film of 25 minutes about the Namibian coast produced for the Ministry of Environment and Tourism - Namibian Coast Conservation and Management (NACOMA) project by Francois Odendaal Productions (2009). Part 3: Activities, threats and potentials on the Namibian coast and way forward. Zanzibar: all Tuesday flights between March and April 2010 have been cancelled. Zanzibar's international Kisauni Airport (ZNZ) is undergoing some maintainance work and therefore the airport's runway will be closed every Tuesday between March and April 2010. Zanzibar Airport will be closed from 07h00 to 19h00 on these days. The airport is currently served from all major East African airports (such as Kilimanjaro Airport, Nairobi Airport, Arusha Airport, Mombasa airport and Dar es Salaam Airport), from South Africa's OR Tambo International Airport and from some European airports. Purple Palms Flashpackers and Travel Lodge offers free airport transport to and from O.R Tambo International Airport in Johannesburg, free internet use and is your best value for money budget lodge. We are a self catering Backpackers lodge just 10 minutes from the airport. Your free airport pick up is arranged door to door. Lay back and relax after that long haul flight in our exquisite rooms or our lush green garden. Our place is spotlessly clean and well equipped. Enjoy our en-suite private rooms, the cozy dorm, and the ample ground around the gardens or sit on our veranda. Rooms have safe boxes, bedding and towels are provided. Our private rooms consist of double en suite, twin en suite family and friend en suites and a 3 bed dorm room. Single rates are available. Most rooms have TV's lots of packing space and have Safe boxes and heaters. We have a laundry service on request. In doors we have a TV room and DVD player, SAT TV and a fully equipped kitchen. Public phone incase you have left your mobile behind. There is FREE internet in our recreational room and place to play board games. We have travel info there and even more on our sister site www.TravelComments.com. Out doors chill by the thatched bar, play a game of pool, listen to music, read a book or splash around or drink a cold beer in our pool. We have an outside fire at night and a bit of a laugh as well. Ample secure parking for your airport car hires. The Lodge is very clean and is always kept in a high state of good maintenance. We are a Baz Bus stop. We drop off to airport for small fee. Our location is perfect for the jet hopper. Tour companies use us as a pick up and drop off point. There is a pub across the road for those intrepid explorers who favor a local chat and a beer. Shops are only 200 meters away and a mall1km. We offer transport to and from places of interest for a small fee. The area is safe for walk about. We offer a wide range of tours, overlanders and safaris, car hire and day tours at recommended prices. We can give special agent discounts. Please see www.TravelComments.com for more info or enquire with us. Please see Hostel conditions when booking for more info. We always try our best to help clients, so please do not hesitate to ask about anything you may have on your mind. Please help us with a good Hostel review. I can assure you the staff will be delighted. Have a great stay and enjoy your holidays! ACSA (Airports Company South Africa) just announced that from today stricter hand luggage restrictions are coming into effect at Johannesburg's OR Tambo International Airport. 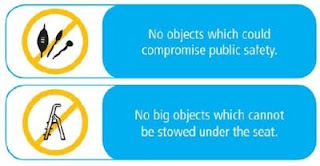 Cape Town International Airport and Durban International Airport will implement the stricter regulations from 06 Feb 2010. There will be a road closure of the R102, eastern approach towards Garden Route National Park’s (GRNP’s) Nature’s Valley from 13 Jan 2010 to 31 May 2010. Between the Tsitsikamma Camp site/Car park and the Groot River Bridge (appr. co-ordinates S 33 58.140 E 23 33.599). At the viewing point 3.5km from Nature’s Valley at the top of the eastern side of the Groot River Pass (appr. co-ordinates S33 57.610 E 23 33.881). Temporary road signs will erected at R 102 turn-off from the Toll gate at the N2 and at the bottom by Nature’s Valley turn-off of the R102. 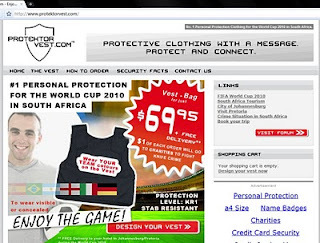 While reading today's news headlines I came across the website protektorvest.com - an online shop for protection vests specially made to be used during the 2010 World Cup in South Africa. Priced at $69 you can design your own vest - you can place a badge of the flag of your team right in middle of the vest. Great, isn't it. You can alternatively add a "free hugs" or "Olè" badge to it. Even better, hey. Well, I first thought that the website is kinda joke and everyone is taking it too serious, but havin a facebook fanpage and a twitter account (tweets look like serious ones...) it doesn't seem to be one. Anyway, I am not too sure about it. I still hope its a joke. UPDATE: The website is actually no joke. See buanews.gov.za article "2010 stab-proof vests 'opportunistic business'". Browsing through the internet I just came across Neal Collins' 2010 World Cup inspired book "A Game Apart". The author is a London based sports journalist who grew up in South Africa. The fictional book is based on what he witnessed as a student, footballer and very junior sports journalist in South Africa from 1979 to 1985. The description of the book on amazon sounds really interesting to me. "The greatest football tournament on earth will take place in Africa for the first time next year, with the World Cup kicking off in Johannesburg on June 11. A GAME APART tries to explain just how miraculous that simple fact is. K'Naan's "Wavin Flag" is the official anthem of Coca-Cola's 2010 FIFA World Cup program. The track "Wavin' Flag: The Celebration Mix" is a remixed version of "Wavin' Flag", which appeared on K'Naan's album "Troubadour". The Song will be used as the main music element throughout the entire 2010 World Cup golbal campaign of Coca Cola. for a "live" version of the song click here! btw - both artists, K'Naan & Akon, are acutally Africans. K'Naan was born in Somalia and Akon in Senegal, but both migrated to the US and Canada as they were kids. Durban's new airport will be known as "King Shaka International Airport"
The South African Geographical Names Council announced the new name for Durban's brand new airport in La Mercy yesterday. Its only needing the approval of the Minister of Arts and Culture and from than on the airport will be known as "King Shaka International Airport". Durban Intenational Airport will get closed at the 30 April 2010 and King Shaka International Aiport will take over the following day and should be fully operational during May 2010. The 2010 World Cup air traffic is planed to be managed by the new airport alone with the old one being used in case of an emergency and possibly to park aircraft should it be required. The brutal 16-year civil war in Mozambique is over since 1992, but the country is still covered with landmines affecting the everyday life of many Mozambicans. Some of the minefields were already planted decades ago by the Portuguese colonial army. Later on, during the actual civil war, the fields were set by the forces of the Frelimo government as well as by their South African-backed opponents. Once placed in the ground, it is really difficult to get rid of landmines. Therefore many innovations have been made - one of them & probably one of the most effective is to train the African Giant Pouched rat or 'Cricetomys gambianus' for the mine detection task. APOPO, a charity registred in Belgium and headquartered in Tanzania, is running a demining project in Mozambique utilizing the local resource. In 2009 roughly 310,000 square meters of land was cleared of landmines by the sniffing rats of Mozambique brining it to more than one million square meters in total. Zanzibar: power on the island only back around end of February? The island of Zanzibar is without power since 10 Dec 2009 due to a breakdown affecting the 30-year-old undersea cable providing electricity from the Tanzanian mainland. Now the acting Energy Minister of Zanzibar told the media in a press conference that the power outage will last for a minimum of another 6 weeks (20 Feb 2010). He assured that the government of the semi-autonomous island is working 24/7 on the problem. The opposition party (elections on Zanzibar are scheduled for later this year) is planning a mass protest in Stone Town for Sunday (17 Jan 2010). As South Africa prepares to host the 2010 World Cup, Farayi Mungazi, the voice of African Sport on BBC World Service’s Fast Track, crosses the continent to explore the history of African Football and tells a story that is by turns epic and unexpected. As South Africa prepares to host the 2010 World Cup, Farayi Mungazi, the voice of African Sport on BBC World Serviceâ? ?s Fast Track, crosses the continent to explore the history of African Football and tells a story that is by turns epic and unexpected. Adebayor, Droga and Essien are African football superstars who have found fame and wealth in Europe, but as Farayi Mungazi tells us, there are many who have failed in the quest for glory. Farayi Mungazi looks ahead to the 2010 World Cup in South Africa and explores how racial politics have affected football's development in that country. Hostelword: $5 off your next booking! Book min. 2 nights via hostelworld in one of the great destinations listed below and get $5 off your next booking with hostelworld! The promotion is starting at 9am GMT on January 12th 2010. Melbourne, Prague, Edinburgh, Venice, Florence, Buenos Aires, Stockholm, Tokyo, Hong Kong, Bangkok, Vienna, Milan, Brussels, Budapest, Singapore, Munich, Auckland, Miami, Lisbon, Kuala Lumpur, Rio de Janeiro, Galway, Krakow, Seville, Kyoto, Brisbane, San Francisco, Santiago, Beijing, Puerto Iguazu, Frankfurt, Ho Chi Minh, Bruges, Los Angeles, Christchurch, Perth, Istanbul, Granada, Manchester or Marrakech. When you book 2 nights or more in any of the cities listed above, you will be rewarded with $5 off your next booking! $5 credit valid for 30 days from your original booking. Promotion is subject to availability and terms & conditions. With every three consecutive nights booked at one of our Camps countrywide, Namibia Wildlife Resorts (NWR) will give you a fourth night absolutely free. From as little as R3 000 per person you can spend the perfect 8 day getaway holiday at the magnificent/Ai-/Ais Hot Springs Spa. The Namib Desert also beckons for exploration with an 8 day stay at Sesriem Campsite at R750 per person – stay 8 days, pay for 6. These breathtaking packaged offers are endless and the more nights you book the more free nights you qualify for to turn your dreams into reality. This offer is valid as of 1st December 2009 until 31st July 2010. For more info click here (pdf). Namibia Wildlife Resorts (NWR) is offering all citizens and permanent residents as well as diplomats based in the Southern African Development Community (SADC) member states a 25% discount on all its facilities in Namibia. SADC pensioners qualify for a 35% discount. The offer is valid till 31 July 2010! I recently came across this really interesting & inspiring video footage of Stefan Sagmeister talking about "The power of time off". Every seven years, the designer closes his New York studio for a yearlong sabbatical to rejuvenate and refresh his creative outlook. In the video below he explains the often overlooked value of time off and shows the innovative projects inspired by his time in Bali where he spend his last year off..
Reason enough (and by watching the 18min video you'll understand why) to do a sabbatical every seven years. TED is a global set of conferences devoted to Ideas Worth Spreading. It started out (in 1984) as a conference bringing together people from three worlds: Technology, Entertainment, Design (TED). See their website for more info. South Africa: up to 40% discount on accommodation bookings! Hostelbookers slashed their prices lower than ever before, and with travel dates from the 7th January - 31st March 2010, you can start the year with a travel adventure. All promotional prices are valid for bookings made from 7th January 2010 until 28th February 2010! 1. All promotional prices are valid for bookings made from 7th January 2010 until 28th February 2010 and are valid for accommodation dates for the period of 7th January 2010 to 31st March 2010 inclusive. 2. Not every Hostel accepts same day bookings. 4. The Sale only applies to bookings made through HostelBookers. 5. Offer valid for new purchases only and not for existing bookings. 6. Prices are not guaranteed until purchased. 7. Normal HostelBookers terms and conditions of sale apply. 8. The sale prices do not apply to bookings made via the group bookings form.